As for now, the whole copyright just enacted will be temporarily suspended, as the staff are currently trying to work on a better solution. ;3 So keep your eyes open for a new policy on images soon, but as for right now, there is no restriction on image use, though we do ask for you to please be aware and respectful of the art you are taking, especially those with a direct link, watermark, and/or copyright on the image. I have always like the former name and the current banner. The site is perfect how it is, though I know it hasn't changed much in the last couple of years. A make over would be nice, could you please leave the rest of the site as is ? Like, the black background and the blue lining for everthing. Its easy on the eye and rather calming if you ask me. 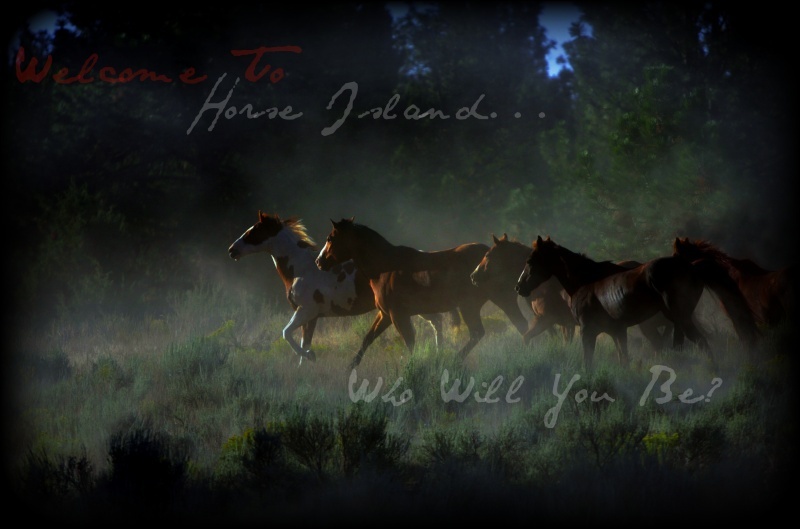 Horse Island is a great name, its been that way for years, why did you guys change it? Call of the Wild seems a bit childish to me. But oh well. The banner is awesome, something that is burned into my mind lol If you plan on changing it, please take an entry that keeps it realistic looking and not some cheesy deviant art crap. Its not a cartoon. Yeah, I'm agreeing with Angel on this. Everything about this site is amazing. The background, the banner, everything. It's not hard on my eyes, and very comforting. It makes me feel at home.